On the 1st April 2001 the replacement of windows and doors came within the scope of the Building Regulations for England and Wales; therefore any replacement of Windows and doors in your home are subject to the requirements of these Regulations. This was one of a number of changes designed to improve the thermal efficiency of our Homes and to assist the Government in meeting its commitments to reduce CO2 emmissions under the Kyoto Agreement. It will also mean that our homes are warmer and use less energy. You can meet your commitments under the Building Regulations by either applying for approval to replace your windows and doors through your Local Authority Building Control Department or by using a contractor/installer who is registered with FENSA. The FENSA scheme was set up by the Glass and Glazing Federation with the co-operation of the Office of the Deputy Prime Minister (the Government Department responsible for Building Regulations) as a Competent Persons Scheme. This scheme enables registered businesses to certify through FENSA that the Installation meets the current Building Regulations. FENSA will register your installation electronically with your Local Authority and send you a certificate which records that your installer has certified that the installation meets the appropriate Building Regulations. A FENSA Registered Business is required to understand the Regulations and be capable of installing a product in your home, which meets requirements. He will therefore advise you on the design of windows and doors and see that the installed windows have the correct thermal performance. 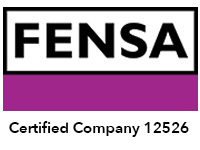 FENSA also organise, on a random basis, the inspection of a number of installations, through inspection agents, to ensure that Building Regulations are being met. You may therefore be contacted by one of our inspection organisations. A FENSA Registered Business is also required to offer you the opportunity to purchase an insurance policy directly from the insurance provider, to cover the window/door guarantee should the registered business cease to trade. The registration of the installation with FENSA does not imply any warranty as to the quality of the product. In registering the installation the installer is certifying that the job conforms to appropriate Building Regulations. The installer is not permitted to fit non-compliant products. If these are fitted you will have committed an offence under the Building Act 1984, as well as possibly putting yourself and others at risk. It is also a requirement that the installation is registered: it is not an option to ignore this part of the process. If your windows are not registered directly with the local authority or by a FENSA Registered Business then you will also have problems when you sell your home. The purchasers’ solicitor will require evidence, via the registration, that the windows and doors conform to the relevant Regulations.